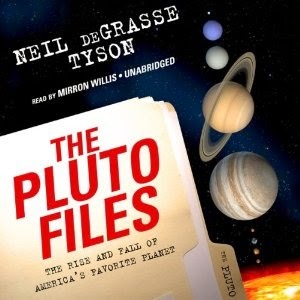 I finished listening to the unabridged version of The Pluto Files: The Rise and Fall of America's Favorite Planet by Neil deGrasse Tyson and narrated by Mirron Willis. Audio length is approximately 4 hours, 24 minutes. I really enjoyed listening to the unabridged audio version of The Pluto Files: The Rise and Fall of America's Favorite Planet by Neil deGrasse Tyson!! It's a short, fun and engaging listen that shares the history of Pluto's discovery and its demotion to dwarf planet status in August 2006. I also enjoyed hearing about all the fuss made by nearly everyone over whether Pluto should remain as a full fledged planet or not. The material presented in The Pluto Files: The Rise and Fall of America's Favorite Planet wasn't boring or dry... It's a perfect read or listen for anyone wanting to learn more about Pluto or are a science/astronomy lover at heart! My only complaint about this audio version is that I didn't like the narrator's voice!! I wish that someone other than Mirron Willis was reading this book... Neil deGrasse Tyson has a good voice, so it would have been awesome if he was the narrator for his own book! The year of Pluto's discovery, Disney created an irresistible pup by the same name, and, as one NASA scientist put it, Pluto was "discovered by an American for America." Pluto is entrenched in our cultural, patriotic view of the cosmos, and Neil deGrasse Tyson is on a quest to discover why. I'm giving The Pluto Files: The Rise and Fall of America's Favorite Planet a rating of 8 stars out of 10 stars. Is It Difficult for You to Remember the Meanings of These 10 Words?? I came across an article on Mental Floss titled 10 Words With Difficult-to-Remember Meanings by Arika Okrent, which I found interesting! So, which words have the most difficult to remember meanings?? 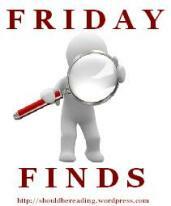 Click on the above link to learn which ones! Looking to Be a Guest Contributor For a Literature Blog?!? 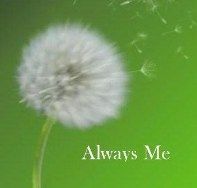 I enjoy promoting book and literary blogs. As I love it when others promote my book blog as well. It just so happens that another Bookcrosser, Sarah, has started a new literary blog called Belle's Library, which aims to 'celebrate beautiful and timeless literature'. So, if you enjoy literary blogs, then I invite you to visit Belle's Library by clicking on the link above! Also, are you looking for a writing opportunity?! Consider becoming a guest contributor for Belle's Library! For more information about being a guest contributor for Belle's Library, please read the Submission Information requirements for guest contributors. Any questions you have about being a guest contributor for Belle's Library should be directed to the blog/website owner... Contact information may be found on the 'Submission Information' link above. Last week, I listened to the unabridged audio version of The Son by Philipp Meyer. I purchased a copy of The Son by Philipp Meyer as it was a book club selection for a local book group I've joined. Quite frankly, I'd never heard of Philipp Meyer before until he was chosen for the book group. The Son is a novel that I wouldn't normally go out of my way to select as a book to read or listen to as I'm not that much into historical novels set in the Southwest... In this case, The Son primarily takes place in the US State of Texas. Nor, do I usually read novels with multiple narrators from different time periods either... However, in an effort to expand my reading horizons, I decided to go ahead and listen to the unabridged audio version of this novel. After listening to The Son, I can't say as I was profoundly moved by the story. I didn't love or hate this novel. I simply can't help but think that I'll forget the details of it in the very near future. The most interesting characters in The Son were J. A. McCullough and Eli McCullough, but the other main characters weren't all that interesting. Total playing time for this unabridged novel is approximately 18.5 hours. I found it interesting to learn that The Son had been nominated for the 2014 Pulitzer Prize for Fiction. I personally wasn't enamored enough with this novel to ever fathom that it would be nominated for such a prestigious prize as the Pulitzer Prize. Below is an interview of author, Philipp Meyer, talking about The Son. It's about the 'American Creation Myth'. Hmmm, interesting concept for a novel... But I didn't ever think that was the message the author was trying to convey in The Son. I listened to the unabridged audio version of Blockade Billy by Stephen King and read by Craig Wasson. Also included in this audio edition is the short story 'Morality' by Stephen King and read by Mare Winningham. Total playing time for this audiobook is approximately 2.5 hours. I am by no means a baseball fanatic. In fact, I don't pay a lot of attention to baseball these days. That didn't stop me though from enjoying Blockade Billy immensely. It is both well written by Stephen King and well read by Craig Wasson. I also thought that Morality, a short story, by Stephen King and read by Mare Winningham was also terrific and suspenseful! Even the most die-hard baseball fans don’t know the true story of William “Blockade Billy” Blakely. He may have been the greatest player the game has ever seen, but today no one remembers his name. He was the first—and only—player to have his existence completely removed from the record books. Even his team is long forgotten, barely a footnote in the game’s history. The plot overview for Morality can be found at the following Wikipedia page. I am giving both Blockade Billy & Morality by Stephen King a rating of 7 stars out of 10 stars!! 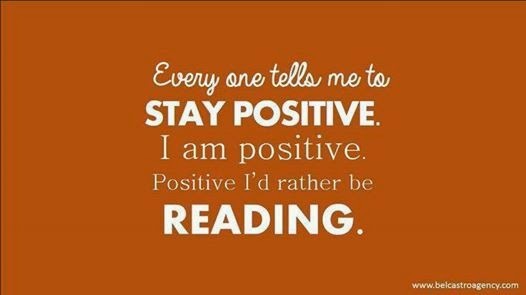 Alright, I admit that I'm an avid book reader, which is no big surprise, right??? After all, I do have a book blog, which professes my love for all things books!! 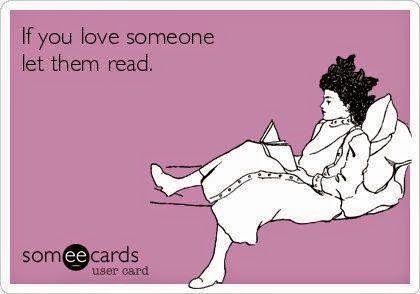 As an avid reader, I'm always a bit amazed when I come across someone who isn't an avid reader... Or, at the very least, someone who reads books occasionally, even if they do not read books as frequently as I do. What I find most shocking, are the few people who have told me that they haven't read a single book since high school or college. Say what??? I couldn't imagine not reading books! I realize and respect that some people have very busy lives that may prevent them from reading several books a year. Or that these same individuals have other hobbies/interests other than reading books. But, I'd always thought (or at least suspected) that in some way, shape, or form, that most people read books on occasion for one reason or another even if they aren't die hard readers. So, when I came across an article yesterday on Bustle.com titled The 6 reactions Book-Lovers Have To People Who Don't Read by Kristen Scatton, I couldn't help but feel that Scatton did a fairly good job nailing my own reactions to those who do not read books. I’ve heard those words, or similar variations (“I haven’t read a book since high school,” or, even more mind-blowing, “Reading is boring”) many times in my life, and without fail, they inspire within me a tangle of emotions that leaves me speechless, at least momentarily (which is no easy feat). I understand that not everyone can enjoy reading as thoroughly as I do (actually, that’s probably a good thing; if that were the case, I’m pretty sure nothing productive would ever be accomplished), but to genuinely dislike the act of reading? You may as well say you don’t like breathing or eating. Checkout the six reactions book-lovers have to people who don't read by clicking on the link above and reading the full article. Do any of these reactions/feelings resonant with you? Bout of Books ~~ Day 7 Update!! Yay, I don't know about you, but I'm having a blast so far participating in the 11th round of Bout of Books!! Things are off to a great start for me on my first day and I'm hoping to finish strong! If you haven't heard about Bout of Books, then please read the following blurb to learn more! - Listen to two unabridged audiobooks. - Comment on other posts made by other bloggers participating in this challenge. I finished listening to the unabridged version of Breakfast At Tiffany's by Truman Capote. Listening time for this novella is 2 hours, 52 minutes. I also began listening to The Son by Philipp Meyer today. I finished the first three compact discs for a total listening time of 3 hours, 28 minutes. Total time spent listening to books today was 6 hours, 20 minutes. Today I continued listening to The Son by Philipp Meyer, but only listened to two compact discs as I didn't have much time to devote to reading today. Total time spent listening to books today was 2 hours, 16 minutes. Today I continued listening to The Son by Philipp Meyer. I listened to a total of three compact discs and have now finished listening to a total of eight compact discs. I am now officially halfway through The Son and have eight more compact discs to finish listening to before the end of this read-a-thon. Total time spent listening to books today was 3 hours, 13 minutes. I continued listening to The Son by Philipp Meyer today. I listened to a total of three compact discs again today (the same number as yesterday) and have now finished listening to a total of eleven compact discs out of a total of sixteen compact discs. I was hoping to listen to more today, but it wasn't meant to be. I'm calling it quits early today. Total time spent listening to books today was 3 hours, 22 minutes. Like This, Try This Challenge hosted by Writing My Own Fairy Tale. Today I didn't participate in any of the challenges. I did continue listening to The Son by Philipp Meyer and finished listening to two more compact discs for a total of thirteen compact discs listened too thus far. Only three more compact discs left to listen to and I'll be done with The Son!! Total time spent listening to books today was 2 hours, 26 minutes. Once again, I didn't participate in any of the Bout of Books challenges offered today. However, the good news, is that I did listen to the remaining three compact discs of The Son by Philipp Meyer. Yay, I finished my reading goals for the Bout of Books Read-A-Thon!! I'll write a review of The Son by Philipp Mayer and post it on my blog soon. Total time spent listening to books today was 3 hours, 9 minutes. Today is the last day of the Bout of Books 11.0!! I can't believe it's all over with until Bout of Books 12.0 comes. Today I completed another challenge the 5 Book Challenge. Since I completed reading both books I set for my reading goals for this read-a-thon, I began reading another novel today titled Instant Temptation by Jill Shalvis. I finished reading the first 32 pages of this novel and look forward to reading more of in the days to come. Bout of Books Day 7 ~~ 5 Book Challenge!! 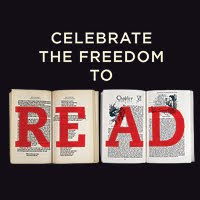 Today is the last day of Bout of Books Read-A-Thon 11.0!! I've been having a blast with this read-a-thon. I've even finished my reading goals a day early and enjoyed participating in some of the challenges. Today I'm excited about participating in the last challenge of Bout of Books 11.0 titled the 5 Book Challenge and is being hosted by Falling Down the Book Hole. Given the short amount of time you are only able to take 5 books with you. What books would you pick to take with you as you escape and prepare for the end of the world. Would you choose books that would help you survive in the post-apocalyptic world, books for pleasure that would make you happy and take you to a fantasy reality or books that you can’t live without? 1. Gilt by Association by Tamar Myers --- I've been wanting to finish reading the Den of Antiquity series for sometime now and this is one of the three titles left for me to read in the series! 2. Baroque and Desperate by Tamar Myers --- I've been wanting to finish reading the Den of Antiquity series for sometime now and this is one of the three titles left for me to read in the series! 3. Death of a Rug Lord by Tamar Myers --- I've been wanting to finish reading the Den of Antiquity series for sometime now and this is one of the three titles left for me to read in the series! 4. The Master & Margarita by Mikhail Bulgakov --- I read this novel years ago and loved it!! I've always wanted to reread it, so now is the time. 5. Pack of Two: The intricate bond between people and dogs by Caroline Knapp --- I love dogs!! The bond between dogs and humans is amazing so this book needs attention. So, which five books would you bring along with you and why?? Back to School Reading List From io9!! I love io9's Official Back to School Reading List of Must Read Books by Annalee Newitz because it's a list of great reads for all of us attending the school of life!! I love the different categories/genres featured in Newitz's article and books recommended for each one. The book titles listed in this article are not the typical classics one would expect to find in the standard back to school reading list of must read books. Click on the above link to view the entire list of books! Bout of Books ~~ Day 6 Update!! Bout of Books ~~ Day 5 Update!! This week, I honestly didn't think I'd find the time to shop for books as I'm participating in a week long read-a-thon called Bout of Books... But alas, how am I suppose to resist visiting a brick and mortar bookstore (even if it was for only fifteen minutes) while out running errands earlier this week?? And also downloading ebooks from Amazon and an audiobook from Audible? Bout of Books ~~ Day 4 Update!! Bout of Books ~~ Day 3 Update!! Bout of Books 11.0 ~~ Day 2 Update!! Bout of Books 11.0 ~~ Day 1 Update!! Bout of Books 11.0 ~~ Playlist Challenge!!! Are You a Member of Good Reads?